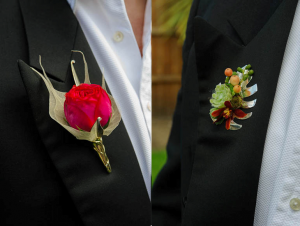 We’re in the peak of prom season so prime time to get your name out there amongst your local teenage scene, promoting your wares and making it known that corsages and buttonholes are an essential item for the end-of-year ball. 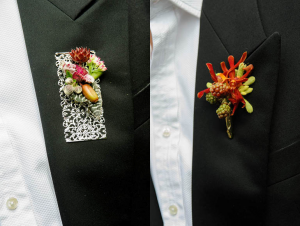 This week we’re sharing inspiration for buttonholes; because the boys need a special school-leavers accessory too, and the range of boutonnieres from Corsage Creations is perfect for teen prom-goers because it allows for maximum creativity and lets you be a bit more ‘out there’ than your average grown-up groom. The Florentine offers a large flat surface perfect for getting the cold glue out and getting creative. Below. Say goodbye to fiddly stem-wrapping with this Calla Lily boutonniere which acts as a miniature vase for the most delicate of flower heads, with just a touch of glue needed to hold everything in place. We love Philip Holley’s choice of colours and materials here; kanga-paws combined with blackberries! Above. This simple and elegant idea also uses the Calla Lily boutonniere plus some Chic Leaves with a dainty, tight rose head on a bed of skeleton leaves. Below. 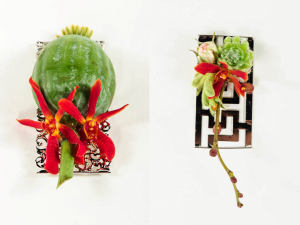 The Monstera Bouttonniere is another piece perfect for gluing. If you’ve a pick ‘n’ mix prom bar set up in-store, have some delicate flower head ideas on-hand so your customers can pick the materials themselves. Above. The Calla Lily boutonniere also works with larger stems too, and looks sleek with its namesake. Below. Days and more occasions to come. Below. 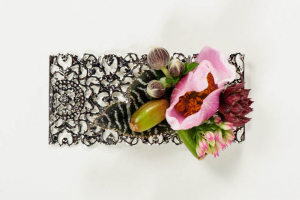 Use the Grecian or Florentine as a blank slate and completely cover in flower heads or just add a few adornments. Above. 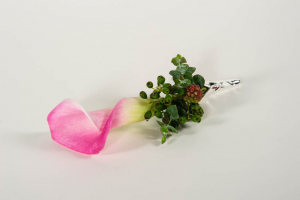 For easy-to-glue boutonnieres in a whole range of styles plus loads more prom accessories and essentials, visit corsagecreations.co.uk.